**Children from families with Per Capita Income (PCI) below $800 will be fully subsidised. ***Parents are required to join in at around 5pm. Sometimes life isn’t easy. Our inhibitions and limitations make it hard for us to think out of the box, solve problems or even foster relationships as we constantly find ways to respond to the many challenging situations that are presented to us in today’s world. As Little Kindness says, Kindness can be the cure to many of life’s challenges. All it takes is some effort, compassion, teamwork, creative-thinking and a whole lot of empathy to make a difference in others’ lives, and hopefully, in the whole world. 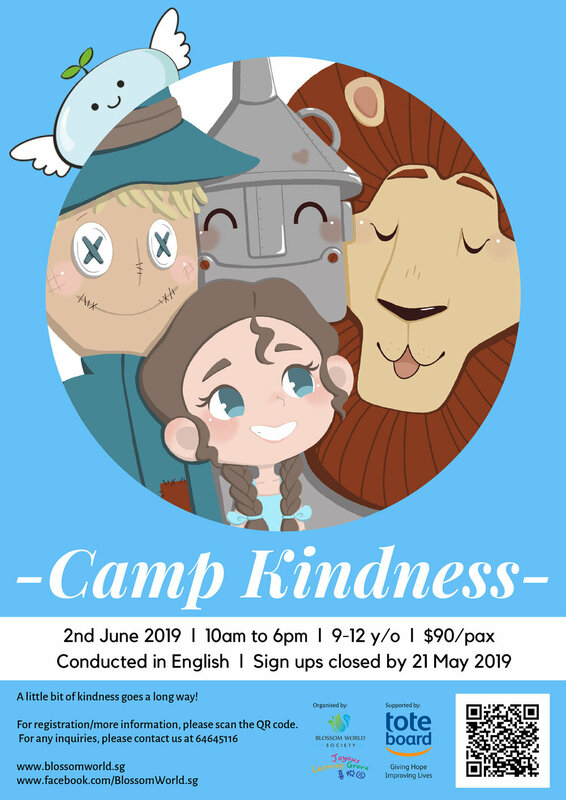 Welcome to Camp Kindness! A little bit of kindness, goes a long way! The Joyous Learning Grove Speech & Drama camps will be led by Elaine together with her team of artist educators. Elaine Ng is the co-founder of The Learning Connections (TLC), a progressive arts organization dedicated to bringing young people together to engage in meaningful arts experiences that promote creative exploration, collaborative learning, and inspiration for the imagination. TLC collaborates with National and International Agencies as well as Preschool Organizations to provide high quality and authentic arts integrated programmes and arts education for children, families and teachers. Elaine holds a Master’s Degree in Early Childhood Education from the University of South Australia and a Diploma in Speech and Drama from London Teacher Training College. She has more than 20 years of experience working with children, families and early childhood educators. She conducts arts education workshops for preschool educators and parents while she tirelessly promotes the arts to be integrated into the Singapore preschool core curriculum. She also heads the Continuing Education and Training committee at the Singapore Drama Educators Association (SDEA).